Teachers are creative and we really do love creating and crafting and DIYing for our classrooms, but there comes a time when buying supplies from a teacher supply store, like Really Good Stuff, just has to happen. 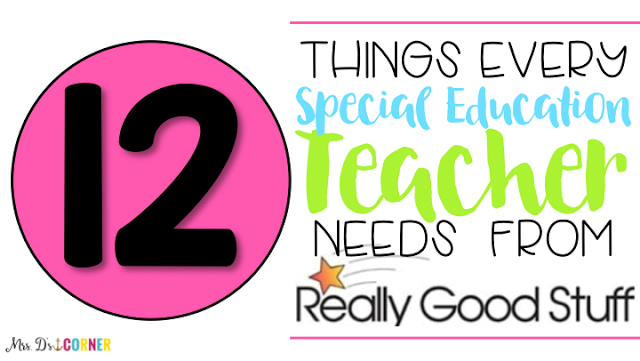 This list of teaching and classroom supplies from Really Good Stuff includes 12 things every Special Education Teacher needs. Not likes, not wants, but an actual need. Things that will not only make our life easier as the teacher, but also the lives of our students too. *Please know this list is not endorsed by RGS and I am not being compensated to write this post. Any suggestions are honestly and truthfully my own. All of our students with special needs have goals and objectives they are working to master. What better way to celebrate the mastery of a skill or goal with one of these bracelets! My first year teaching Life Skills, I didn’t even know these were a thing! I purchased these classroom light filters at the beginning of last school year, and can I just say #gamechanger. I have the blue ones and WOW! Did it ever make a difference in the atmosphere of my classroom. With the amount of structure students with specials needs need, yet with adaptability to meet sensory input needs, among all other needs, these chairs are perfect for our students. They come in 3 different sizes to accommodate all ages of our learners. Not only will these give your students a reference for lining up appropriately, but you can practice number recognition at the same time. Great for little hands, especially the little hands who are struggling with pencil grip. I will be using these this school year to send home a weekly/monthly Reading Toolkit. The pouch is water-repellant and has no-rip seams, which is perfect for our kiddos. Velcro keeps the pouch closed, and they easily fit right inside of backpacks. tablets with or without their protective cases. Silicone bumpers prevent scratching. I probably have more of these bins that I would like to comfortably admit, but I know that when I need one, I have one. They are super durable and can be used for so many different things in the classroom. Really Good Stuff has these bins in 12 colors too, so you can color code your heart away! Any special needs teacher knows that we have manipulatives on manipulatives on manipulatives, and even more manipulatives to spare. Plus endless PECS and laminated pieces, with the need for more storage always looming around us. These bins come in many sizes to best accommodate what you need. PLUS it’s a great fine motor workout when students need to open the container! A clipboard WITH a TIMER on it! Say what! I don’t plan on using this for a “clock-out”, rather I plan on using it for data collection. I have so many clipboards in my classroom and I’m keeping data all. the. time. as are ALL special needs teachers. I can only imagine the positive impact of having an actual timer on 1 or 2 of my clipboards. Genius! PS. To cover up the words “classroom clock-out”, I will probably use a white avery label. Color coded timers that are virtually indestructible? Yes please! These have so many different uses, but I like to use them during cool off periods and in the Calm Down Area. It helps teach time to my students, especially when a student is frustrated and 1 minute feels like an hour to him or her. *This is not an endorsed blog post; all opinions written within this post are honestly and truthfully my own. I love these ideas…esp need the tablet charging station! Thanks for linking up! That charging station did not get good reviews. I bought a wire dish drainer and zip tied a power strip with plugs and USB ports on it to the side of it to plug in the chargers. Then line up the tablets or ipads. Looks very similar to photo and a lit cheaper. I love any help that I can get! Want to share an alternative to the wobbly chair might be a balance disc. I just bought 2 from an Avon clearance outlet for $9.99 each.